Eskmills Venue is managed by Hickory. Hickory’s Environmental Policy can be found on their site, here. At Eskmills we are committed to ensuring that the environment is safeguarded for future generations and to continually improving our performance through our active environmental policy. We are a member of Visit Scotland’s Green Tourism Business Scheme. Our kitchen includes locally-sourced produce in their menus. Calculate your carbon footprint by rail, car, bus or plane here. We are committed to helping to reduce the impact of our activities on the environment.  A symbol of this commitment is our membership of the Scottish Tourist Board’s Green Tourism Business Scheme and our pledge to the Resource Efficiency Pledge. We have made significant efforts to reduce our carbon footprint and the amount of waste that we send to landfill. recycle dry mixed recyclables such as paper, cardboard, cans and plastics; glass; are among the items we recycle. food waste is recycled and collected by Growing Forth for the production of green electricity and natural bio-fertilisers. we use an eco-friendly biological grease trap to avoid the any grease or fats reaching sewers and drains. low level lighting has been installed areas where light is consistently used for more than 6 hours a day. motion detectors have been installed in parts of the venue and the company relies on the use of highly efficient equipment to reduce the energy and water use. Our team leaders are actively involved in the Green Team that monitor and review our sustainable environment aims and achievements compiled on our Green Action Plan. Projects and issues are then assigned to our Green Champion to investigate, achieve and monitor. Monthly checks are carried out by our Executive team and Green Champion who monitor progress and look for any achievements made in the departments. Here at Eskmills Venue we are committed to reducing the impact of our activities on the environment. A symbol of this commitment is our membership of the Scottish Tourist Board’s Green Tourism Business Scheme. Our Green Team meets regularly to monitor and review our sustainable environment aims and achievements. This group has representatives from all departments within the venue. low energy lighting has been installed in parts of the venue. air conditioning, including in the main venue space, is centrally controlled. We have a positive commitment to reduce, reuse, and recycle where possible throughout the venue. use of bottled water and water machines to minimise water wastage as well as low flow taps installed. We demonstrate a strong commitment to sustainable best practice believing it is essential to reduce its impact on the environment. Eskmills Venue is committed to reducing its negative effect on the planet with significant efforts being made to reduce carbon footprint and the amount of waste that it sends to landfill. Environmental objectives form an integral part of the Company’s Business Plan, as does its Environmental Policy. Eskmills Venue will aim to buy environmentally and socially responsible products. suppliers’ capabilities to address these issues throughout the supply chain. Eskmills Venue believes in making the information and functionality on our web site equally available to all visitors. At Eskmills Venue, we recognise that we have environmental responsibility and are committed to working towards a sustainable future, aiming to become one of the environmentally friendly venues in Scotland. We are members of the Green Tourism Business Scheme, and as an indicator of our sustainable practices we have achieved the Silver Award.